CROOK - SWINDON, THIS IS SWINDON. 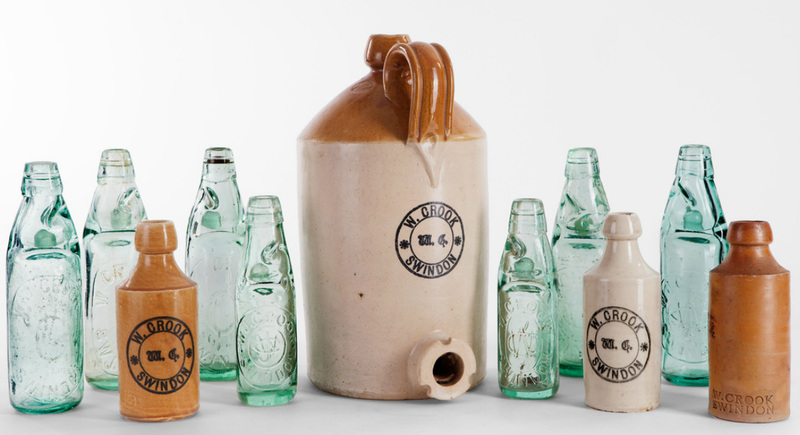 Collection of CROOK Codds & Stoneware 1/2 pint bottles. 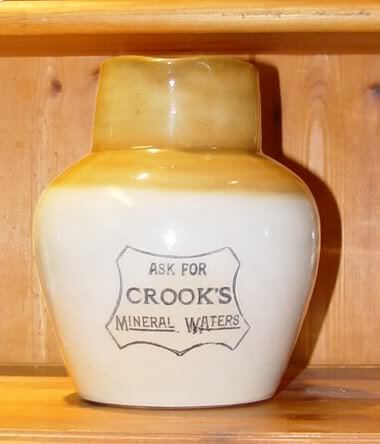 William Crook was born in 1841 in Highworth, Wiltshire. He married Sarah Parsons of Lydiard Millicent, Wiltshire in 1866. 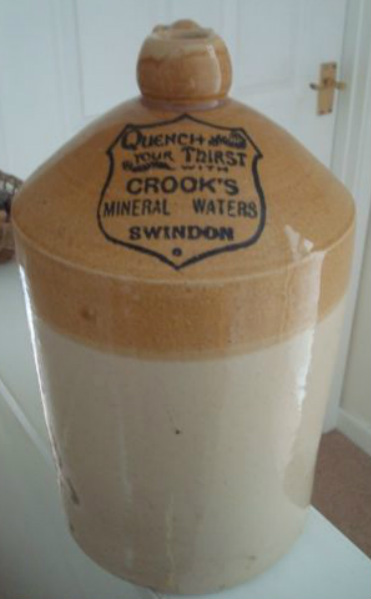 Image taken from Peter Sheldon's informative book "A history of Swindon & District mineral water manufacturers"
William started working for Edwin Robert ﻿ING around 1869 and by 1871 he was working at his North Wilts Aerated Water Manufactory in Lansdown Road, Swindon. According to the census of the same year William was the Manger of Soda Water Works living just down the road at number 6. In 1888 William signed a lease for parcels of farm land belonging to the local Lord of the Manor, Ambrose Lethbridge Goddard. William's occupation is recorded in the lease as Chemist Manager. Presumably he was managing ING's chemist shop in Wood Street. 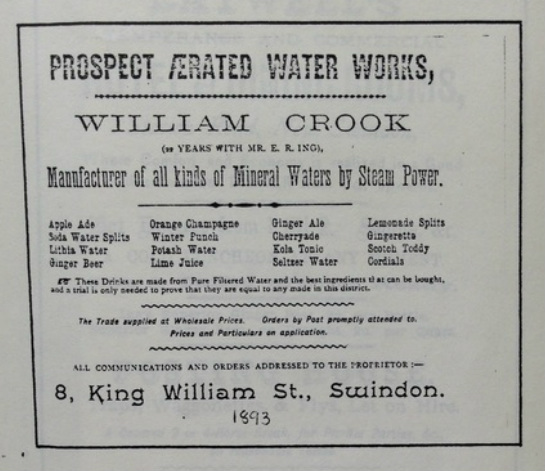 After working for ING for about 20 years and at the age of 50 William went into business on his own and purchased the ﻿PROSPECT AERATED WATER CO﻿ factory in Swindon Road, Swindon. 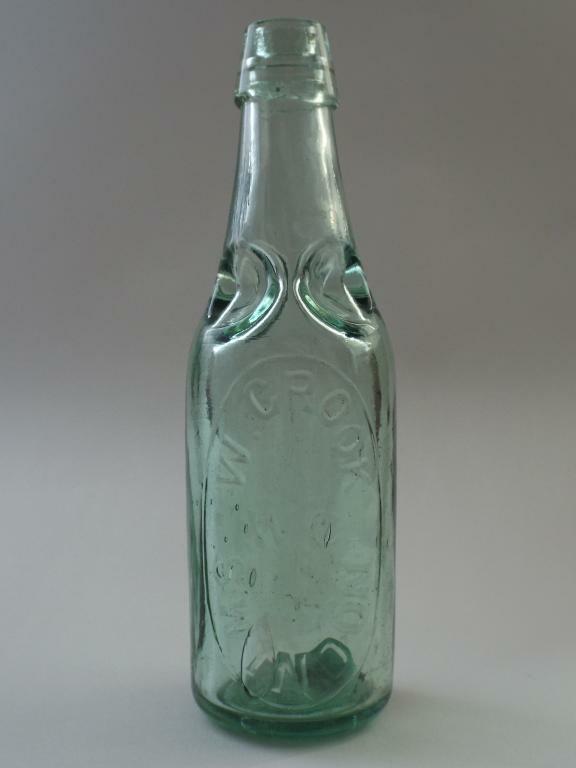 His son, William John Crook (bottles marked W.J. Crook) was to be his assistant. William and family had moved to 8 King William Street, Swindon where he opened a shop selling their drinks. He advertised that 16 different types of soft drinks were available. On the 31st March 1896 plans were drawn up by local architect William Drew to almost double the size of the premises in Swindon Road. 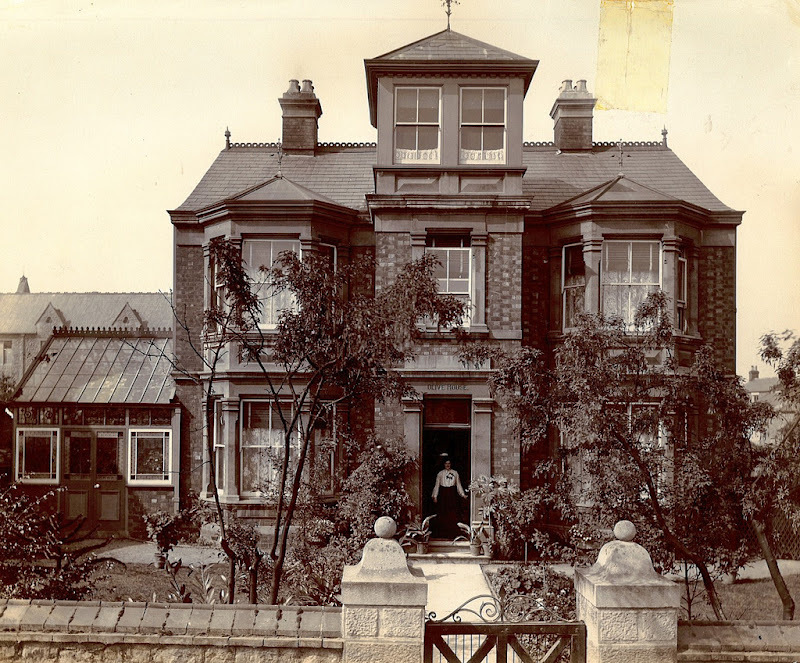 By 1901 with business booming the family moved to Olive House at 11 Prospect Place, Swindon. By this time William John, who is now a traveling salesman for the family business, had married Clara Collier and they have a daughter and a son. On the afternoon of Sunday 25th May 1902 William John Crook attempted suicide by hanging at Olive House. He was saved by his sister Kate. Founder of the business, William Crook, died aged 66 on 14th February 1907. At his funeral his son William John Crook reportedly caught a chill and died, aged 35, of Pneumonia just 16 days later at Olive House, Prospect Place, Swindon. In 1907 & 1911 Mrs Sarah Crook is Iisted in Kelly's Directory of Wiltshire as the owner of the business. 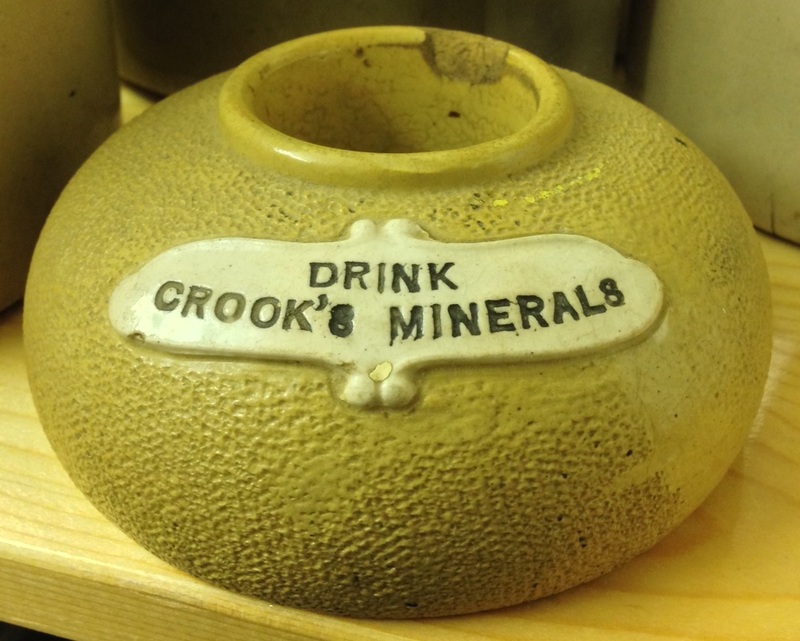 William John Crook's widow, Clara, remarried in 1909 to Edward John Head who worked as a mineral water carter in the Crook business. In 1913 Clara died aged just 46. She had only been remarried for four years. At this time the Crook business was taken over by LEESE. Tragedy seemed to follow the Crook family. In 1917 John James William Crook, only son of Clara and William John, was killed in action in Flanders during WWI.